Credit where credit is due: Nokia is making progress with its Lumia lineup of Microsoft Windows Phones. 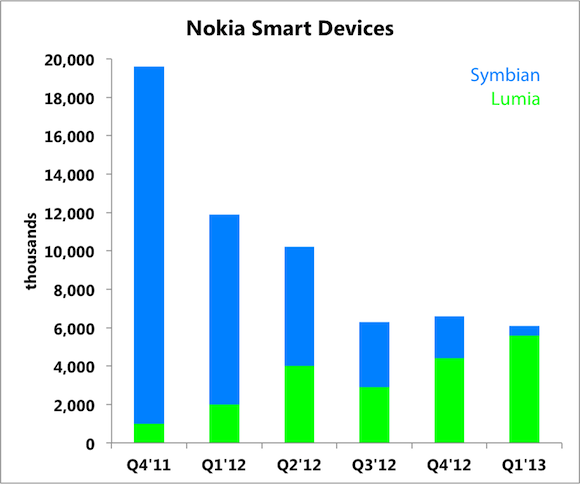 The Finnish smartphone maker just posted earnings, with Lumia units rising sequentially from 4.4 million to 5.6 million. That's notable because most gadget vendors typically see sequential declines coming out of the holiday quarter, but Nokia was able to increase Lumia volumes by a healthy margin. Overall smart device units did decline to 6.1 million from last quarter, but that's also largely a function of the planned drop-off in Symbian units. Devices on that platform fell from 2.2 million in the fourth quarter to just 500,000 this time around. Total revenue came in at $7.7 billion, which was short of the $9.7 billion in sales that investors were expecting. The strength in Lumia shipments wasn't enough to offset weakness in other parts of the business. Nokia's net loss came in better than expected but the top-line miss undermined the bottom-line beat. Asha devices, Nokia's new feature phone portfolio, came in at 5.6 million units, down from 9.3 million. The figures are certainly good news for Microsoft, though, since Nokia is the dominant seller of Windows Phones. For example, the 4.4 million Lumias sold in the fourth quarter represented 73% of the total 6 million Windows Phones sold. If that ratio holds up at all, Microsoft could see close to 7.5 million Windows Phones sold, which could give it a market share boost in the first quarter. First-quarter smartphone figures have yet to be released from the go-to market researchers, but as companies continue reporting results, they'll be due out soon. Nokia still needs to strengthen its position in the important U.S. market, which may come in the form of a new Lumia model on Verizon Wireless. Big Red is reportedly getting the Lumia 928, which will expand the carrier's Windows Phone lineup. It's been hoping to reduce subsidy costs via platform competition. The No. 1 domestic carrier just reported results today as well, with 7.2 million smartphones activated. The transition toward Windows Phone continues to be painful, even though it's starting to bear fruit. The article Shining Lumias Aren't Enough for Nokia originally appeared on Fool.com. Fool contributor Evan Niu, CFA, owns shares of Verizon Communications. The Motley Fool owns shares of Microsoft. Try any of our Foolish newsletter services free for 30 days. We Fools may not all hold the same opinions, but we all believe that considering a diverse range of insights makes us better investors. The Motley Fool has a disclosure policy.